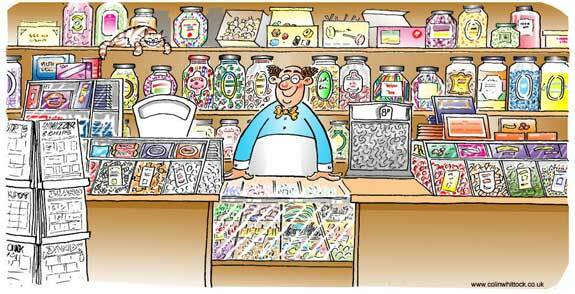 Retro Sweetshops - Why Don't You See Them Around Anymore? Where have all the retro sweetshops gone? It's one of the questions we have been asked over and over since we had the idea for A Quarter Of ... back in 2001. And "why don't you see traditional, old-fashioned sweets anymore?" We modeled A Quarter Of... on a little sweetshop called "The Chocolate Box" at the end of our road when I was young. Sadly it has long since disappeared. It used to be rammed full of old-fashioned sweets, newspapers and comics... and it sold jokes too. Nowadays little sweetshops like that are getting rarer... instead of space for a wide range of retro sweets, little shops like that have become mini-supermarkets - selling milk and cat food and washing powder. So the space for confectionery is massively reduced and they tend to stick to the big sellers, the "safe" sweets like Mars Bars, Cadbury Dairy Milk etc. There's just no space for retro classics like gobstoppers or sugar mice. It's so sad. Are Our Retro Sweets Left Over Stock from the 1970's? And if so, are they still edible? We have genuinely been asked this on a number of occasions! I suppose that people think that, because they haven't seen many of our classic traditional sweets for so long that they aren't made anymore. The good news is that the answer is a resounding "No! Our retro sweets might remind you of the 1970s but they are all freshly made"
So Where Do We Get Our Traditional, Old Favourite Sweets From? When we started A Quarter Of... we had about 60 different sweets. We thought we might get up to about 200 sweet classics... How wrong we were! We are now up to around 650! We hunt long and hard to find new suppliers so that we can stock every retro favourite that is still being made. And we have some of the sweets made specially for us.